Congratulations I'm Sorry is the follow-up to the Gin Blossoms' smash New Miserable Experience, and unfortunately, it merely mimics the group's initial successes. It's too bad. In concert, the Gin Blossoms manages to tear up the stage with its Neil Young-inspired guitar solos and sculpted feedback, but in the studio, it remains content simply to try to mold itself into a hit-making machine. 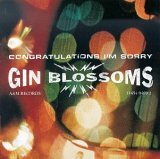 Even so, the Gin Blossoms is quite good at putting together catchy, 3-minute songs, and Congratulations I'm Sorry is full of them. Although many of its tracks tend to blend together, the lead single Not Only Numb remains downright captivating, despite the massive attention it has received from mainstream radio. Nevertheless, it would be nice if the band had leaned a little more heavily upon some of its country-style influences. The guitar solo in As Long as It Matters moves slightly in this direction, and Memphis Time goes all out with a great deal of success. It's here that Gin Blossoms brings some much needed variety to the endeavor. Congratulations I'm Sorry is available from Barnes & Noble.